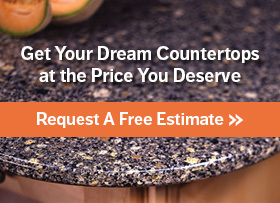 Are you curious about your Wilsonart countertops cost in Maryland? If you’re a homeowner in a place like Baltimore, Columbia, Ellicott City, Annapolis, Alexandria, Fairfax, or any other place throughout Maryland or Northern Virginia who wants to learn all about your options, then keep reading for more information. Do you want your new counters now? Click here to tell us what you want to do and you can start right now. When homeowners are designing new countertops, whether for the kitchen or the bathroom, variety is important. Not everyone has the same requirements for use, and not everyone likes the same colors, so finding a countertop manufacturer that provides products for all tastes and lifestyles is very important. Fortunately, you get just that with Wilsonart countertops. When it comes to countertops, the two main offerings from Wilsonart are Solid Surface and Laminate. So what are the benefits of each type? Solid Surface – Wilsonart Solid Surface countertops are ideal for anyone who makes regular use of their counters. This is a material that can take on the appearance of other types of material without the maintenance requirements. That means that you can have counters that look like they’re made of wood without needing to worry problems like water damage and scratches. Laminate – Wilsonart Laminate countertops are easy to clean and without ever having to give up the elegance that the material possesses. This material makes it easy to have a kitchen that not only turns heads, but allows full functionality as well. This is all possible to get at a Wilsonart countertops cost that is a fraction of what you would pay for some other types of countertop materials, making it a smart choice for the budget-conscious consumer who wants new counters. Functionality isn’t the only way you benefit from Wilsonart counters. In order to truly take advantage of what these fixtures offer, you’ll also be able to choose from a wide range of colors as well as custom countertop edges to really give your counters some personality. It can seem like going through your options and making sense of the features that factor into Wilsonart Countertops cost is a daunting task. Fortunately, with the right help, you can easily get through the process and end up with the perfect countertops for your home. When you want high quality countertops at prices you can afford, then the professionals at Express Countertops are ready to provide you exactly with what you need. We know how important it is for homeowners in Baltimore, Annapolis, Fairfax, Alexandria, and other areas throughout Maryland and Northern Virginia to have fixtures that fit their needs. That’s why our expert contractors and installation professionals will work with you through every step of countertop installation process. From the design of the counters, to the colors, accessories, and placement, everything else, we’ll make sure no detail gets overlooked. You can trust us here at Express Countertops when we say that your counters will draw all of the right attention and make a perfect addition to your home that you’ll love for years to come! You could have your new counters sooner than you think. Contact us today for an estimate by dialing 410-712-0601 or contact us online by clicking here. Once we know how much your Wilsonart countertops cost will be, you could have your new counters within a week!